FDP Forum / Performer's Corner / Where to buy an "Axe Balancer"? Yes, I like the cello pin idea, but it means a significant hole in the guitar plus any further modifications to fix the thumbscrew mechanism to the body. Peegoo's yoke idea is neat in not needing any permanent changes to the guitar. The longer strap pins I saw advertised long ago (really wish I could remember the name and seller) only needed a screw deeper into the guitar than usual to take the extra side to side strain on the pin. We're only talking a couple of inches in pin length to make a big difference to the neck dive by shifting the balance, but it's a good point about not fitting in some cases if it's fixed semi-permanently. 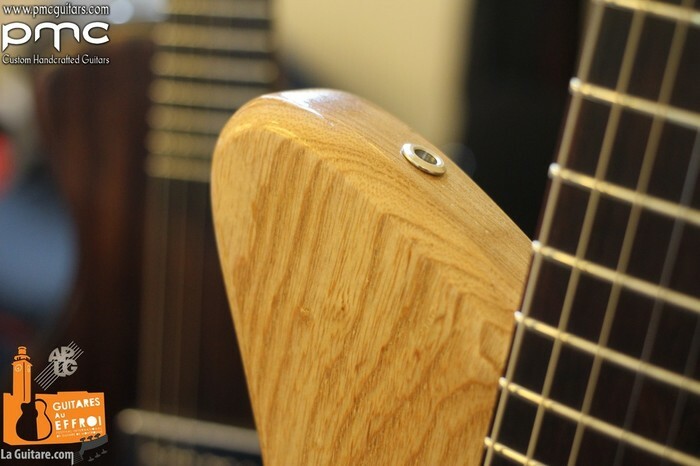 "...it means a significant hole in the guitar plus any further modifications to fix the thumbscrew mechanism to the body..."
The way cello and upright bass endpins work is that the wood bushing that holds the thumbscrew and tail gut is tapered and is wedged into a tapered hole in the body. No fasteners required, but you do need a large specialty reamer to bore that tapered hole. As I said, this is an idea more suited to a custom build than a modification to an existing instrument. Next time I build an electric bass I might try it, though. Hmmm thinking about this further, we could incorporate Dunlop Straploks into the steel bracket. That way it would be removable from the guitar. The guitar would fit in its original case. Pop it on and pop it off. Or just make a longer strap pin with a connector on the end to fit the recessed receiver?